Hood River, Oregon – March 20, 2017 – Say “¡hola!” to Sesión Cerveza, the newest member of the Session family. At 4.5% ABV, new Sesión Cerveza Mexican Style Lager is a light, crisp, refreshing, loco-buena cerveza, brewed for a hot day, a hot date, and anything in between. 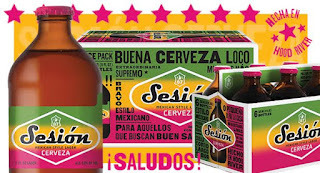 “Straw gold in color, and light in body, Sesiόn Cerveza is brewed with Pilsner malt, flaked corn, and Celeia and Northern Brewer hops,” says Full Sail Brewmaster Jim Kelter. “The pour is pure gold in a bottle.” Sesíon Cerveza offers the refreshing character of the imports in a locally crafted beer, perfect for your next fiesta. The hops impart subtle hints of lemon and spice to complement the crisp malt body. When Full Sail launched the Session brand 12 years ago, it quickly became the hottest new craft-beer brand on the market, which has since brought home 100 medals, including 40 golds. Session’s not a micro, a macro, or an import, but in a way it’s a little bit of each. You see, virtually everyone who likes beer likes Session. It’s a brand that’s accessible without being ordinary. Totally drinkable, but never at the expense of character. And dios mío, new Sesión Cerveza is no exception. Available year-round in 11oz. stubby bottles, in 6-packs, 12-packs, on draft and in the Session summer Mashup variety 12-pack. Hecha en Hood River. Enjoyed everywhere. ¡Saludos! 4.5% ABV, 15 IBUs.